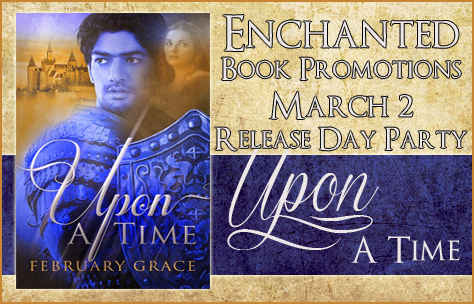 Release Day for Upon A Time by February Grace! A blacksmith’s apprentice who would be a knight. The heir to the throne, at death’s door. One woman who would save them both, if she could… Charlotte was number sixty-four in the second group of young, hopeful maidens intended to meet the Prince at a grand ball in his honor. That introduction was not to be. She returned home to her tiny village—and her visions of a future limited by it—without any warning of the drastic turn her life was about to take. Soon she would be fighting against the odds to help keep a gravely wounded stranger alive; and waging war with her own heart, as he stirred feelings in her she’d never known. 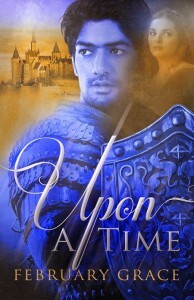 When the stranger’s royal identity is revealed, Charlotte is faced with an entirely different battle: one to keep her family, village, and the injured Prince in her care all safe from a madman set on taking the throne by any means necessary.